Lately, I am paralyzed by recipes. I think this is connected to the relentless cold and darkness of the current inexhaustible winter. Recipes come banging into my head–bœuf bourguignon, swordfish in lemon-butter sauce with white beans and radicchio, banana cream pie–and I am immediately exhausted. The kitchen table is cluttered, I am choosing junky television over books. My attempts at productivity feel shallow, murky. I had lofty, multi-course ambitions to share with you for Valentine’s Day. But the more I thought about it, and the more recipe notes I jotted down, the more overwhelmed I felt. In the end, the Frenchman got a(n under-salted) pot of bœuf bourguignon a week before Valentine’s Day; a Chocolate, Blood Orange, and Candied Brioche ice cream (which I did not make myself, but traded for this cake) on the day; and just the promise of Chanterelle Mushroom Soup at, um, some unspecified point in the future. While he seemed perfectly happy with the arrangement, it displeases me that my usual penchant for obsessive organization has wilted and died in the face of not being able to leave the house/work in my office without turning into a human popsicle. But I am trying, like pulling sand up through water, to pick out and appreciate the bright spots in this present tundra of frozen misery (too much?). Like the long lunch the Frenchman and I enjoyed this weekend, punctuated by bourbon-spiked hot apple cider, blistered pizzas, and a bracing romaine and mint salad with thin crème fraîche dressing. Or trying on my first round of wedding dresses with ladies who ooh-ed and ah-ed and made me feel truly special. And especially the fact that, on Saturday afternoon, barring any further snow-pocalypses, I will be in my bathing suit on the beach in Florida, my pale winter skin thirstily drinking up the sun. That notion is fueling my workweek. Otherwise, sometimes simple technique can make the spinning stop. It is a relief to stand in my dim, quiet kitchen and allow my mind to go blank as I occasionally stir eggs. Feeling my way through heat and time is a meditative, grounding reminder of why I like to cook. 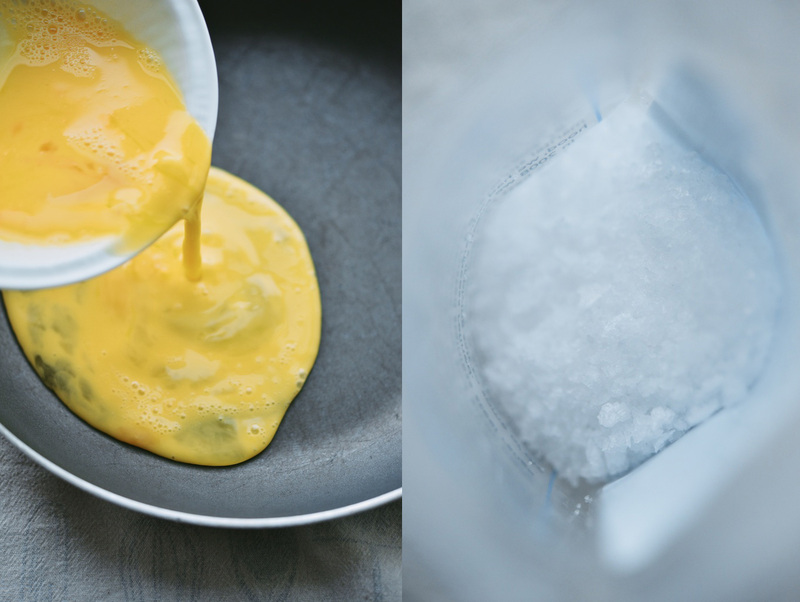 Making quality scrambled eggs is a skill everyone should keep in their back pocket–master this, and you will harness the power to solve breakfast, lunch, and dinner. 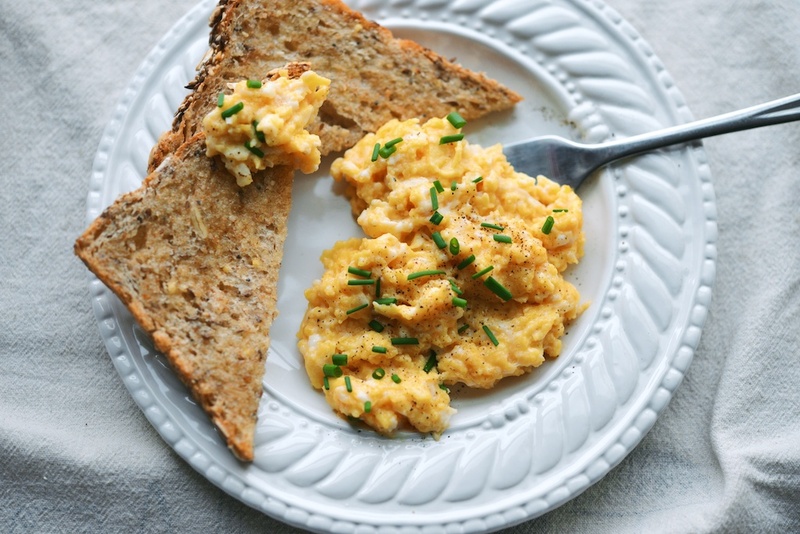 My method relies on basic chemistry and produces velvety, luscious results: when you cook scrambled eggs over high heat, it causes the proteins to seize, and results in a rubbery, unappetizing mess. 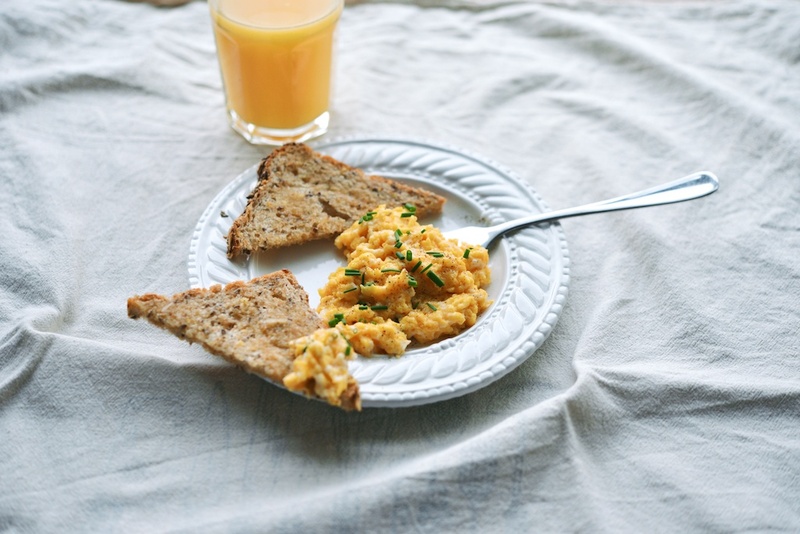 However, cooking over a low flame gently heats the pan and infuses these butter-less eggs with, well, the overwhelming taste and mouthfeel of copious butter. 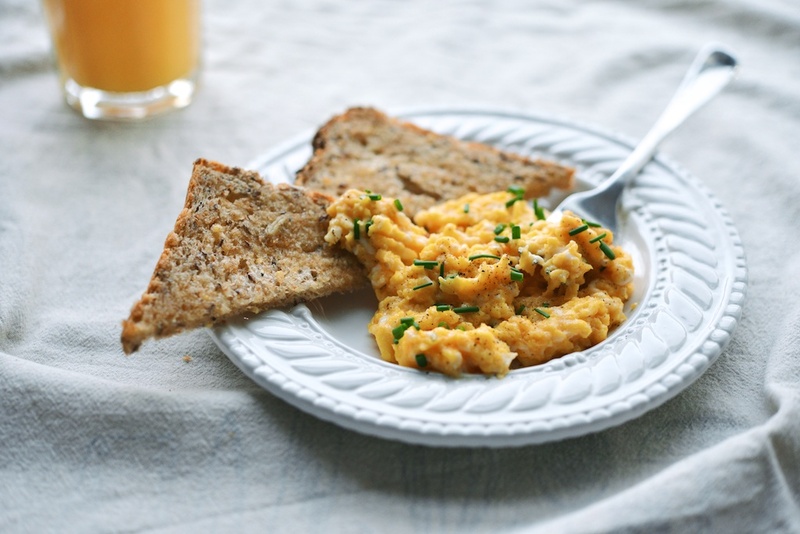 It is really quite simple: Beat 3 medium eggs in a bowl with a fork. Slide the beaten eggs into a cold, non-stick pan, and set the pan over low heat. Nothing much will happen for the first 10 minutes. 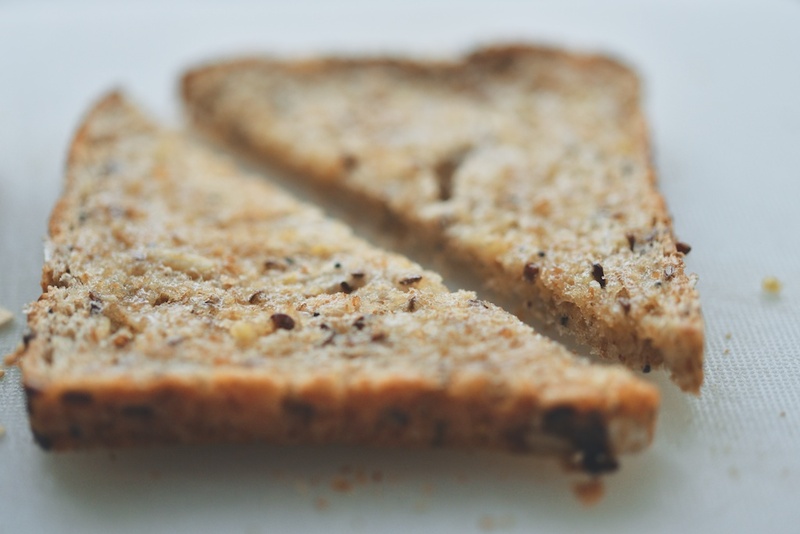 Make some toast, snip some chives; set the table, pour yourself a glass of orange juice. Every couple of minutes, run a spatula around the sides and bottom of the pan. At the five minute mark, sprinkle a healthy pinch of flake sea salt and a couple cracks of freshly ground black pepper over the eggs. In the last five minutes of cooking, pay attention; use the spatula to gently scrape the cooked eggs off the bottom of the pan. 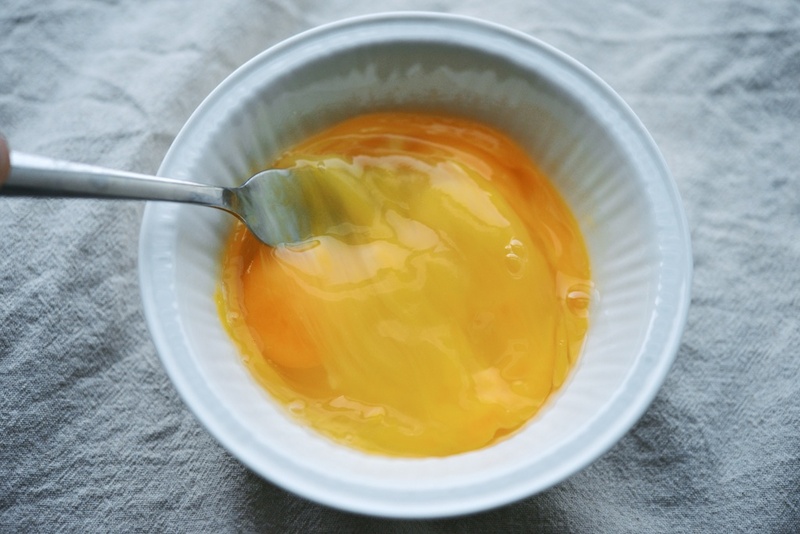 Remove the eggs from the heat when they are still custardy and not quite finished cooking; the residual heat will finish the job. Serves 1. 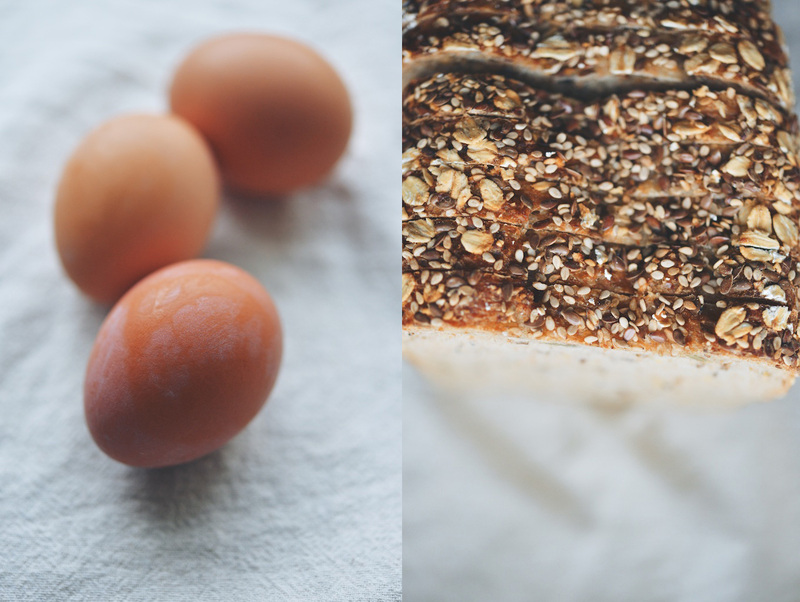 Most simply, I prepare these eggs with flake sea salt and black pepper. However, minced chives and hot sauce are an easy addition. I like to spoon them, bite by bite, onto toast lacquered with salty butter. But the applications for scrambled eggs are nearly endless. They make all manner of meals. At breakfast, I might roll my eggs into a tortilla with melty cheese and a few healthy dollops of fresh salsa. On the weekend, scoop the soft eggs between toasted brioche with radishes, tomato, and crisp bacon. For lunch, I make open-faced sandwiches of scrambled eggs, avocado, flake salt, and smoked fish. 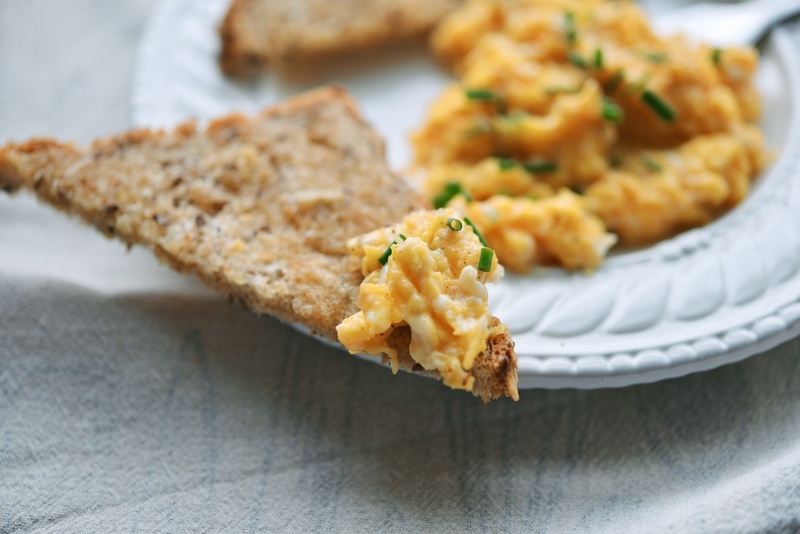 Or, a scrambled egg tartine with herb-and-bean salad. At dinner, serve them alongside butter, thyme, and parsley sautéed mushrooms with crisp-roasty fennel and sweet potato. Or, with fried potatoes, aged ham, and thin wisps of hard and nutty cheese. Your imagination is the limit. Finally, I encourage you to source good eggs. 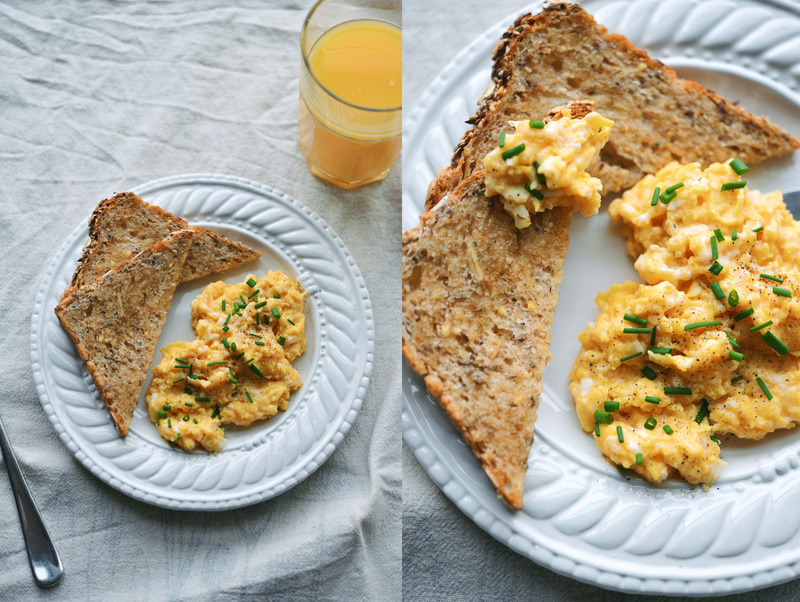 This is exactly how I make scrambled eggs. It was a revelation when I learned to do this, after many years of high heat and rough cooking. Thank you for celebrating one of my favorite foods! Winter is having the same effect on me. 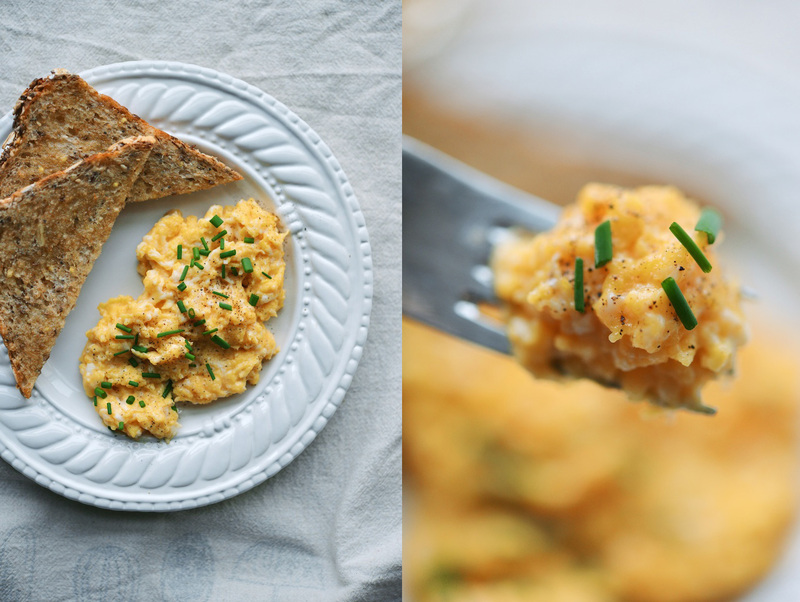 Scrambled eggs to the rescue. What a bright and lovely post. Your writing is stunning. 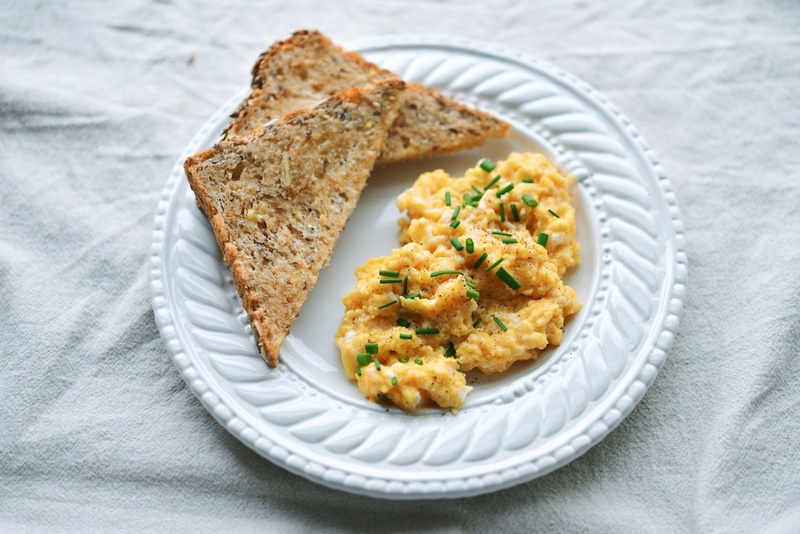 Incidentally, scrambled eggs have been on heavy rotation in our household this winter. My love is deployed with the military and cooking anything more complicated with a toddler on my hip is sometimes just a little too daunting. Plus, both my daughter and I love a good meal of eggs. I will definitely use this method the next time I cook them. your own TV show !! I LOVE your writing ! !